This is a simple science project you can perform at home. Gather four different samples of water - for example, some tap water, water from the ocean or a pond, water from the puddle near the curb outside your house, and water from a bird bath. Using a microscope such as the kids microscope MW1-H1, place a drop of your water sample on a depression slide and put a cover slip over it. Make sure you keep the different types of water samples labeled and separate. What types of bacteria or other creatures can you find? Start out at 40x magnification, then work your way up to 100x and 400x magnification. 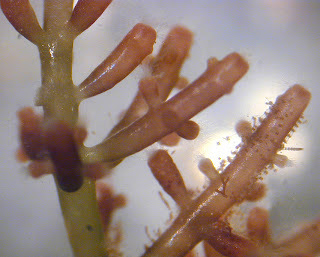 Below are some images of things you may be able to identify through your mircoscope. Euglenas - found in both fresh water and salt water. Learn more about Euglenas here. 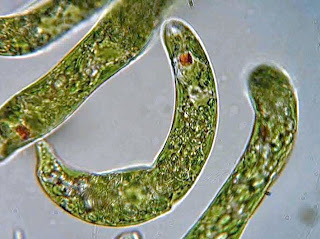 Protozoans - most commonly found in pond water, protozoans can easily be viewed with a microscope at 400x magnification. 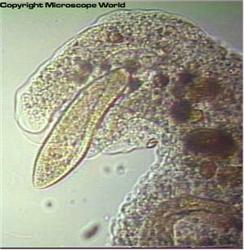 You can learn more about protozoan learning tools here. Photo courtesy of Eric Guinther. Algae - found in the ocean in the forms of kelp and seaweed, these plants come in a variety of shapes and colors. Take notes on the types of microscopic creatures you find in the variety of water collected. If you can capture images of them or sketch the organisms so you can share your findings with your science class.